Pressed for Time: didn’t take pictures. I don’t know how I managed to do it, as I always take photos of my work, but I somehow skipped one. 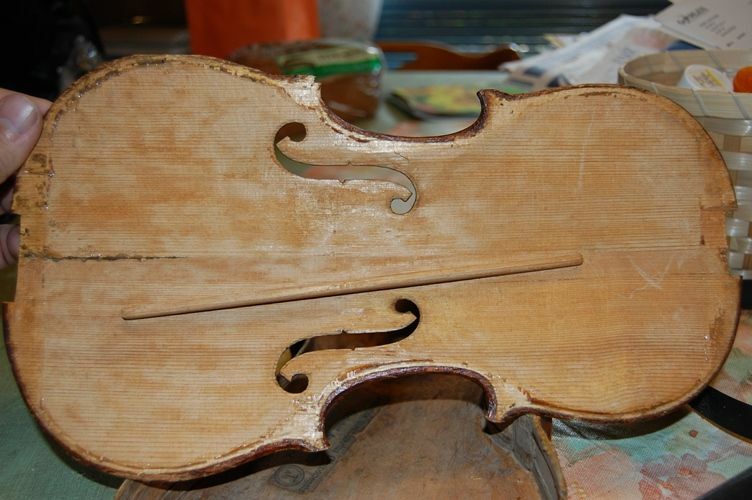 This is only the second violin I have produced from this particular mold: The other was actually the first violin I ever made, so the two can’t really be compared. I changed some things since then anyway, so I have dubbed this mold, as it now stands, the Oliver “Long Model”, since it is a little narrower in the upper and lower bouts, giving it a “long” look, though it is really about the same length as the others. 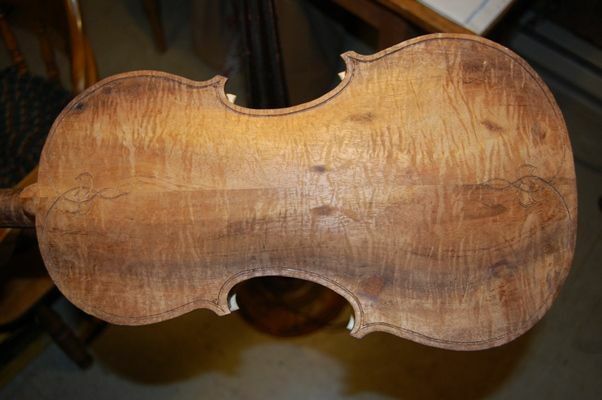 I am pretty certain that the front and back plates are European Spruce and Maple, respectively, but the ribs and neck are not European. I believe the neck is Red Maple that I bought from Elon Howe, in Michigan, and the ribs may be, as well. I wish I had written down all this information when I made the instrument, but I didn’t, and my memory is not coming up with any certainties. Sorry. And it worked out very well. 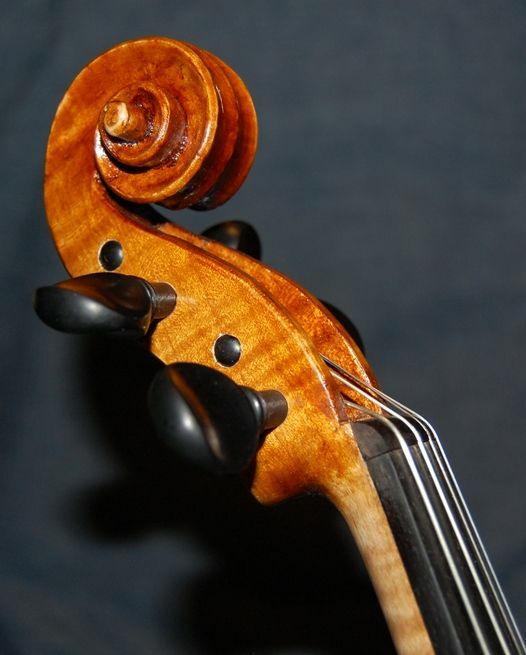 I had very positive reviews from professional players from this instrument as well as those whose arching reflected the Cremonese master (Guarneri del Gesu) I had attempted to copy on those instruments. (Why?) 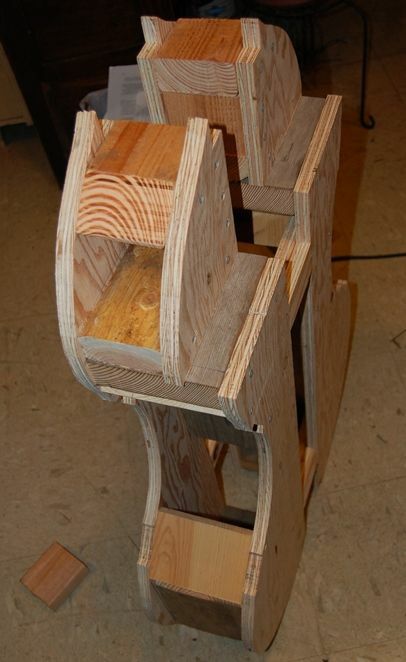 Evidently that is how they originally perfected their arching, as the templates I made from scratch closely matched the templates I lifted from their work. It was an interesting experiment at any rate, and I still have the templates, if I want to use them, and I know how to establish all the curves again, if I need to do so. 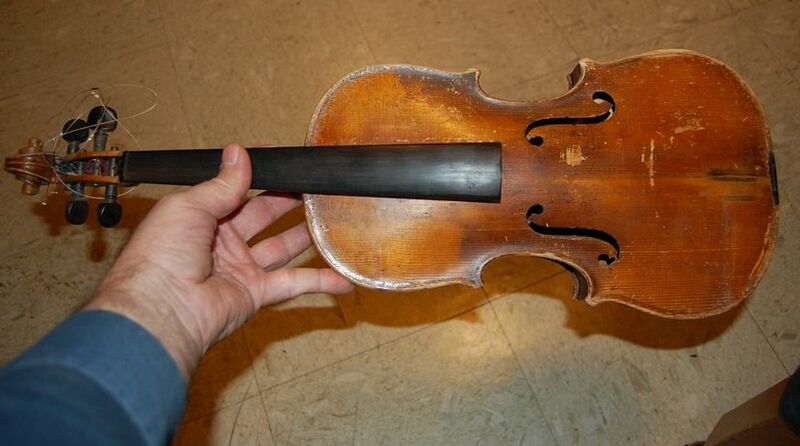 In the meantime, this is a very good violin. This is one of the few instruments on which I chose to apply my finish without deliberately induced “antiquing.” I don’t do it often, because I really like the antiqued look…but I like this one, too, so I may do some more like it. 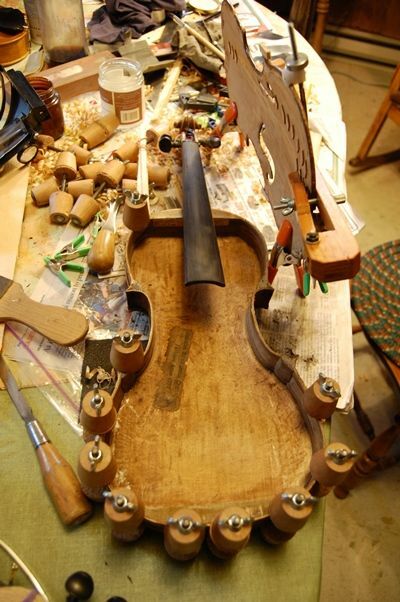 Usually the instrument already has the fingerboard and saddle when “set-up” begins. 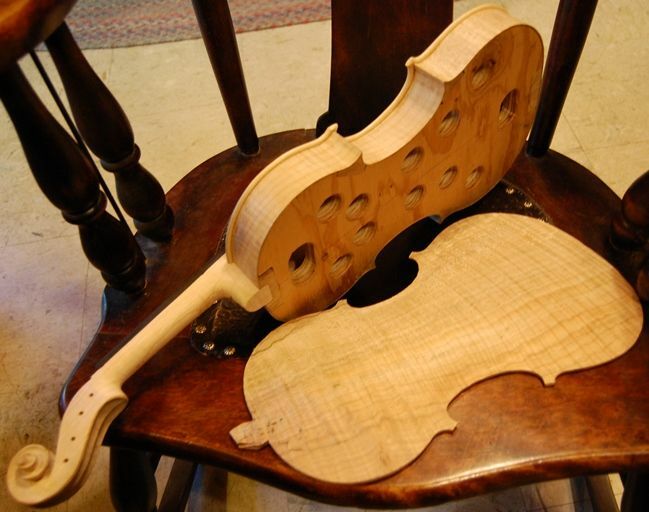 Install the tailpiece, strings and chinrest. 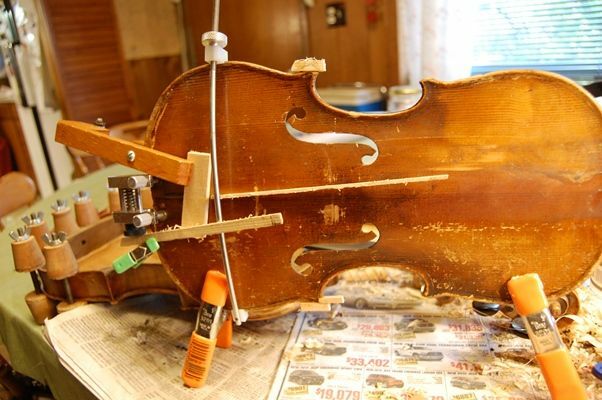 Perform any “final touches”, to repair small varnish flaws, etc. 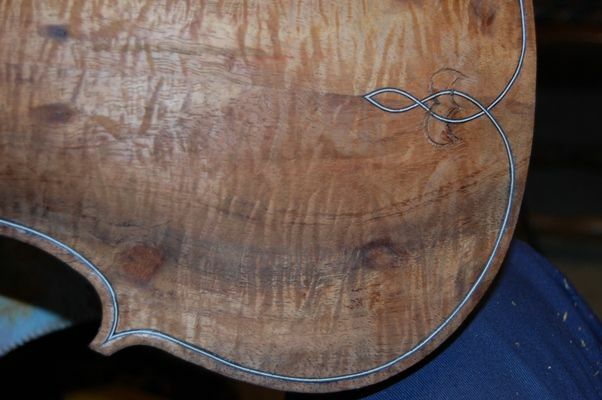 Completed saddle, end-button and tailpiece: notice the curved ends on the saddle. 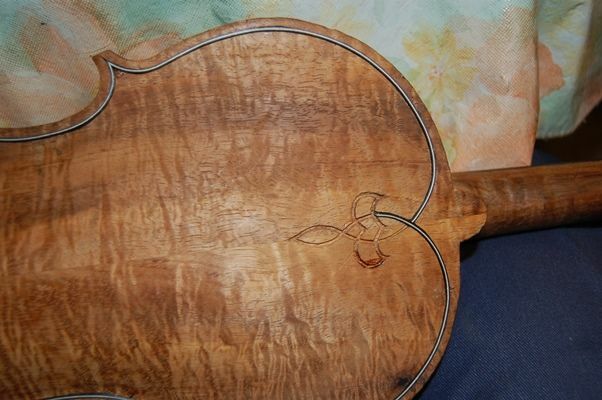 Completed 14-inch viola front side: sitka spruce. 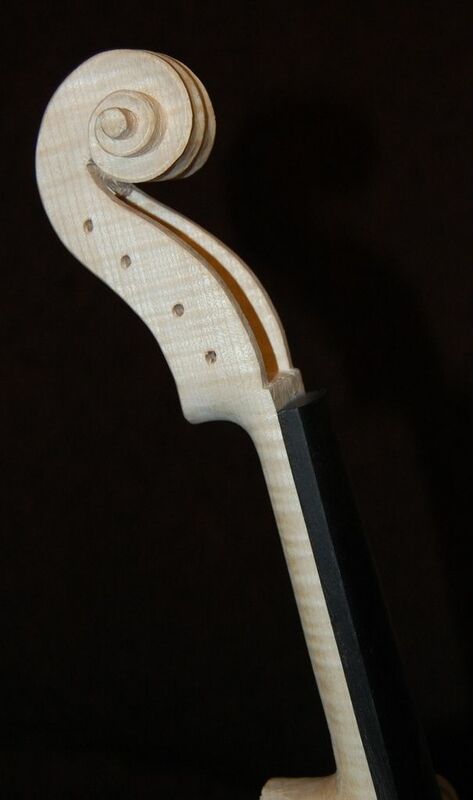 Completed 14-inch viola side view. 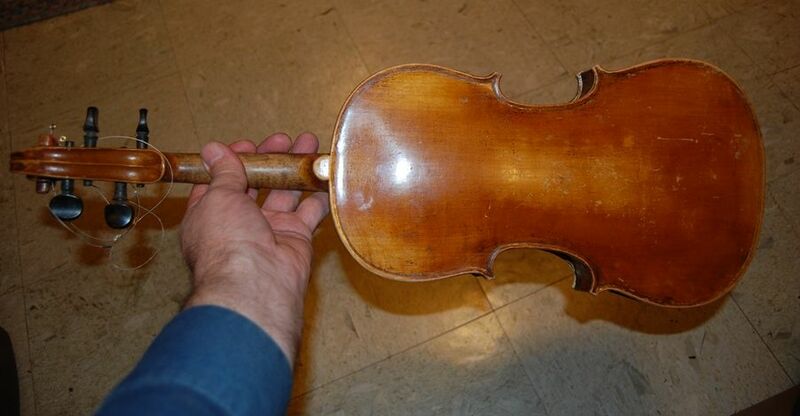 The instrument was slightly tilted away, making the body look large. 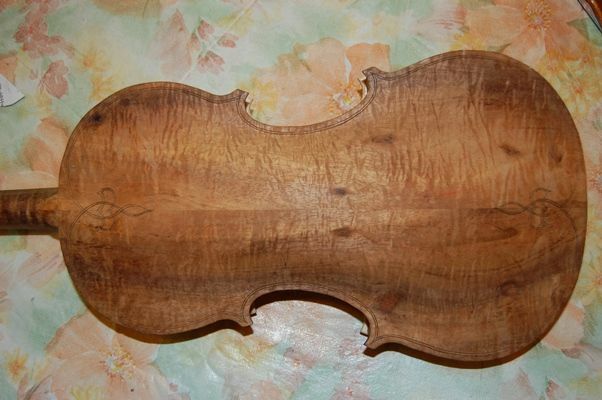 Completed 14-inch viola back. That big-leaf maple is pretty stuff. This was donated by Terry Howell. Completed neck; If you check back a few posts, you can see how different the neck looks before and after polishing and sealing. 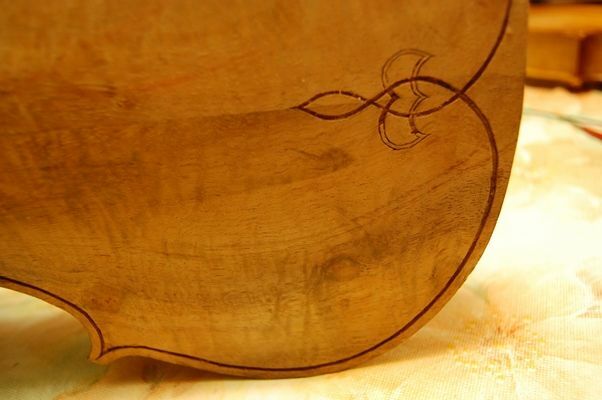 Completed treble-side scroll. This big-leaf maple, for the scroll and neck, was cut in my wife’s parents’ yard, some time ago. 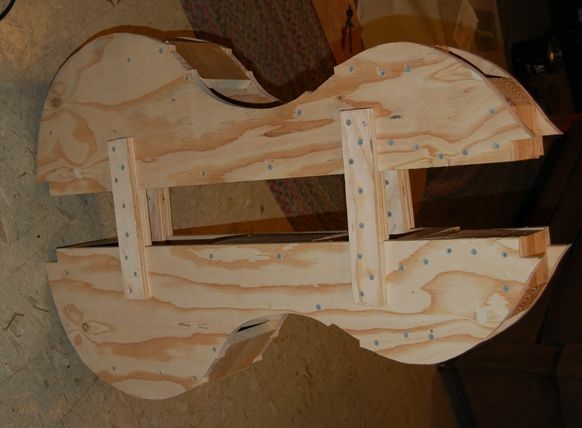 Completed bridge, from the tailpiece side. 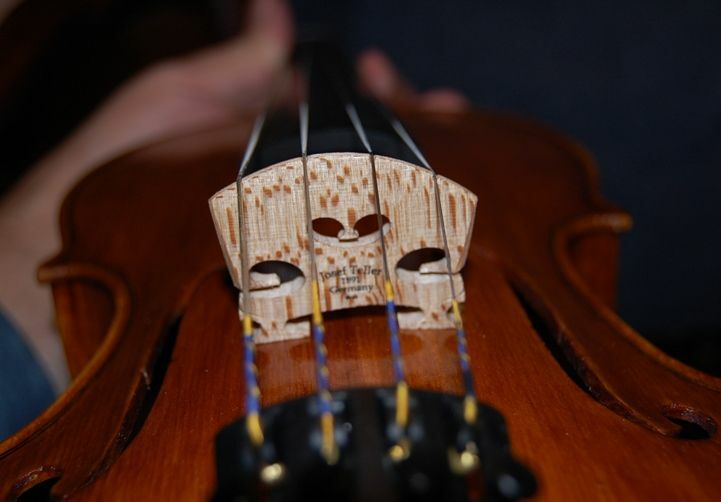 Those are Helicore strings, and a Josef Teller bridge. Bridge viewed from the fingerboard side. Bridge and sound-holes viewed from the front of the instrument. So! That is the 14-inch Viola! I will add a chinrest in the morning, but I wanted to get these pictures posted. So far the sound is good. It is a little unfocused on the C string, but I usually expect some of that at first. I adjusted the soundpost to enhance the C-string, and tomorrow I hope it will have improved. 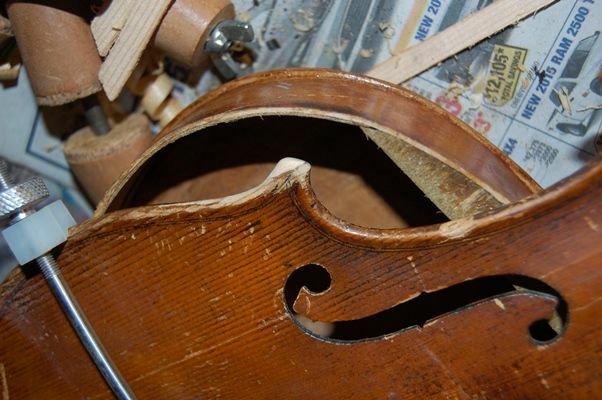 I could tell it was opening up within 20 minutes of hard bowing, so I expect it will be a good viola. 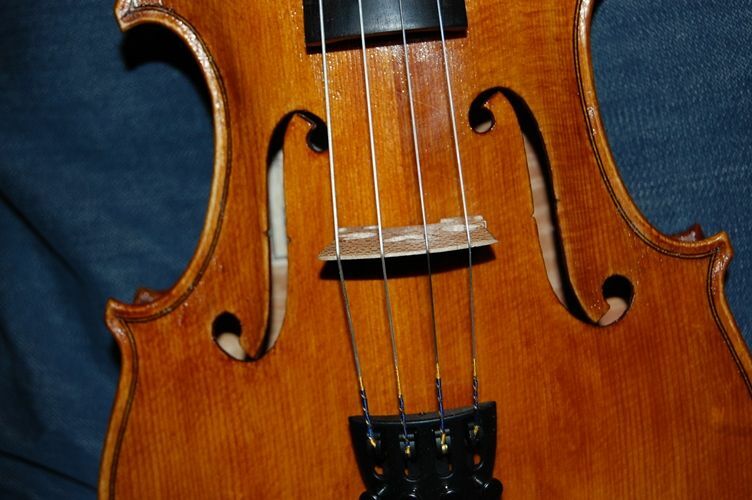 I would prefer orchestral strings, I think, but it is difficult to find a C-string for a 14″ viola. 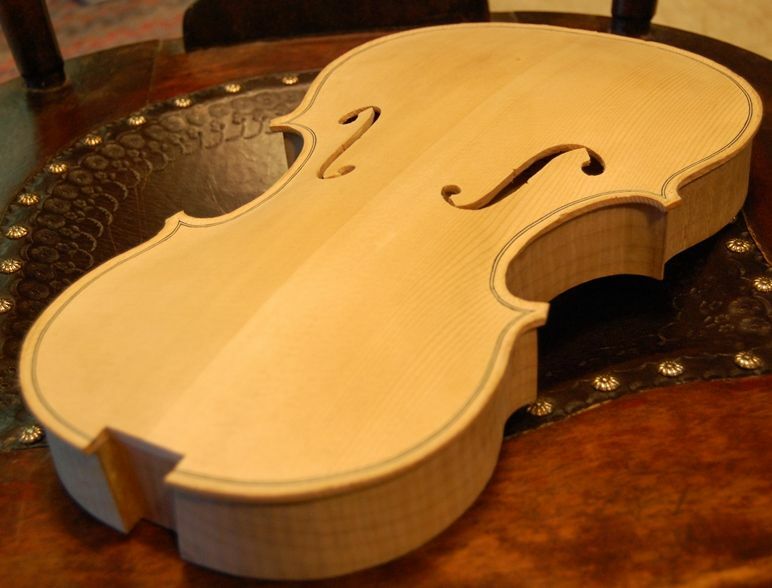 This will make a very good viola for some player with small hands. 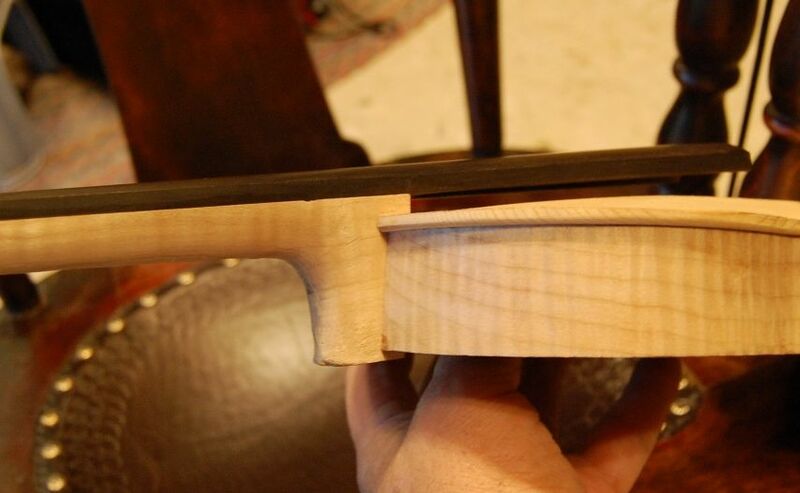 Completed 14-inch viola with chinrest. 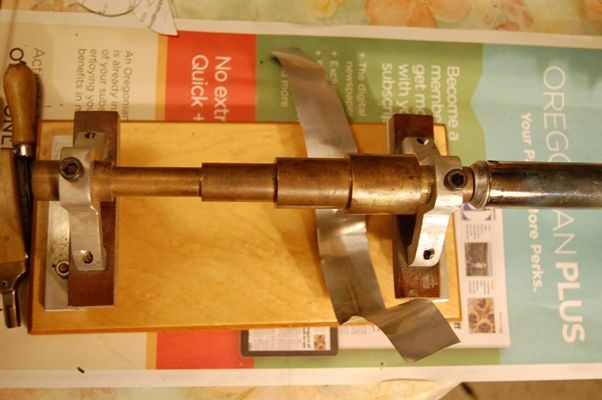 I used a special tool to begin the cutting out progress: It is called an “f-hole drill”, but all it really amounts to is a specialized twin-blade hole-cutter. My children bought it for me, one year, and it has been a wonderful tool. In the first place, obviously, it is a time saver, but the biggest difference is that I can now make the upper and lower eyes of my f-holes perfectly round, to begin with, and work any special shaping in, starting from the already round holes. 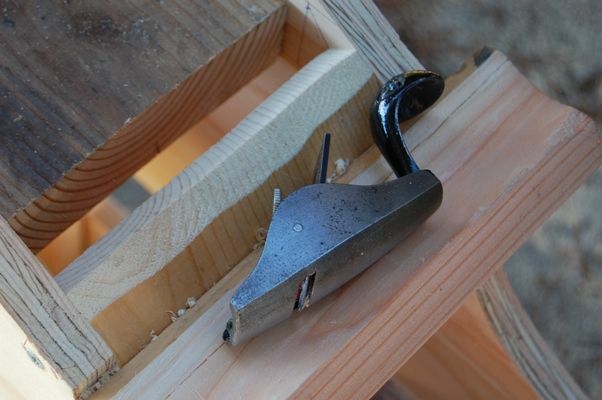 I remove the waste wood from the uprights of my f-holes with a small sharp knife—many makers use a saw, and I have done so as well, but I eventually reverted to the knife. Just personal preference, I suppose. 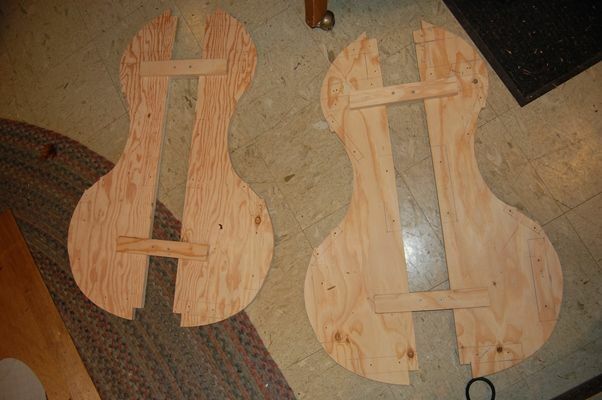 Once the f-holes are cut out and close to perfect (always allowing for later nit-picking), I install the bass bar. The bass bar is a gently-arched brace supporting the bass-side foot of the bridge. 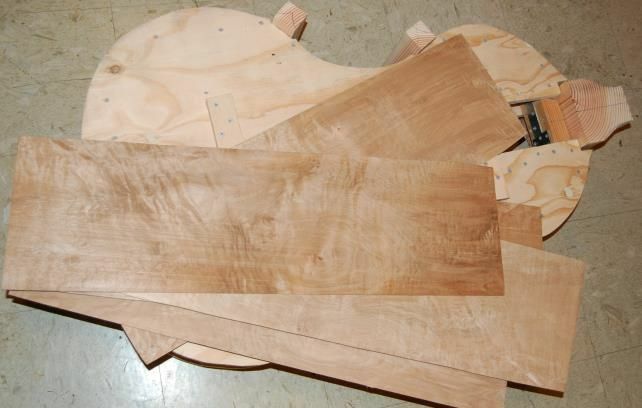 Guitars have a whole collection of similar bracing, supporting what amounts to a nearly flat (and very thin) plate. 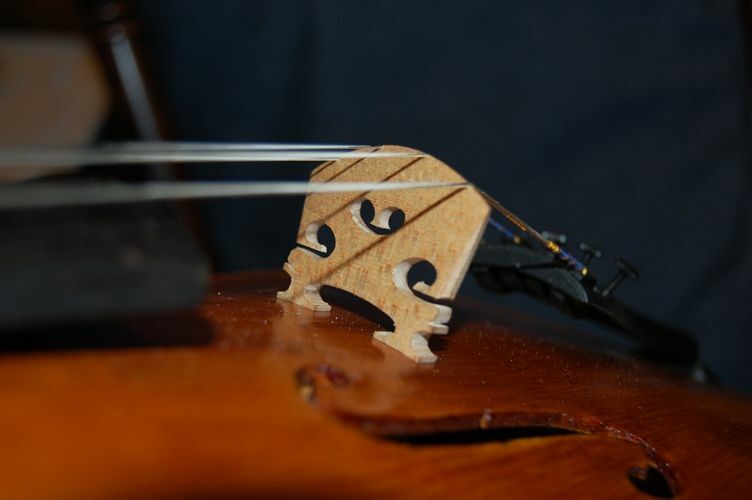 The violin family instruments depend primarily upon the compound curves of the arching to supply strength, and only need the one brace to support the bass-side bridge-foot. The other side of the bridge is supported by the soundpost, which, while it is not directly under the treble-side bridge-foot, it is very close to it, and is in a location on the treble side matching the lateral position of the bass-bar on the bass side. I lay out the position of the bass-bar, and then use a compass to transfer the shape of the inside of the front plate to the bass-bar blank. Then I use a knife to remove most of the waste-wood, and begin checking the results against the inside curve of the front plate. When the fit is getting close to correct…close enough that it is becoming difficult to see what needs to change…I apply a strip of paper-gauze adhesive tape (available in pharmacies) to the inside of the plate, covering the bass-bar position, and I rub blue chalk into the tape. I happen to use a product sold as “sidewalk chalk;” they are big sticks of chalk, and supposedly are easy to wash off of sidewalks. But they work well for me, and the blue is high-enough contrast that I can see it easily. I press the nearly correctly-shaped bass-bar into the chalked tape, and check to see where the chalk transferred. I cut, plane or scrape just the chalked places from the bass-bar, repeating until, finally, when I press the bar into the tape, the whole thing comes up lightly coated with chalk. Then I remove the tape, clean off any remaining chalk from both pieces of wood, and install the bass-bar, using hot hide glue and clamps. 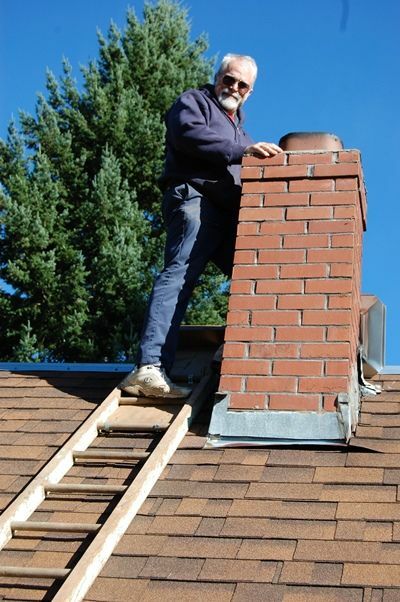 I have a specialized set of wooden clamps made for this task. It is much easier to do the inside edge-work if I do it before I install the plate on the garland. So, I use a tiny finger-plane, along with round and flat files, to round the inner edge of the plate, all the way around the perimeter. I may have to do a little correction later, but I want it as close to perfect as is possible, before gluing the plate to the garland. I line up the plate on the garland as accurately as I can, matching the center-line of the plate to the centerline of the garland, and then use spool-clamps to hold it in place. I was originally taught to use tiny pins to assure good placement, but eventually discontinued the practice. 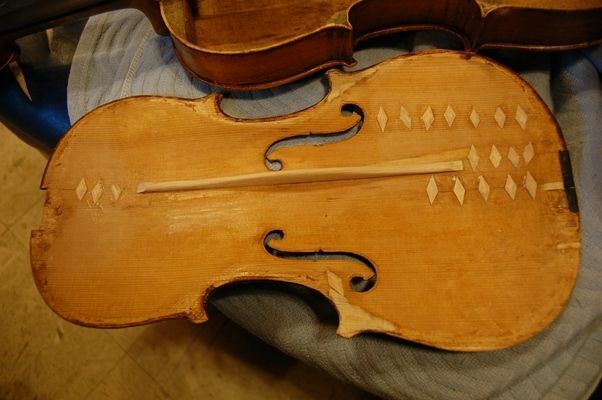 We know for a fact that the old masters did this, as we can see the remnants of those wooden pins in their violins, still today. Perhaps I will eventually resume using pins. For now, I do not. Once I have the plate perfectly aligned and securely clamped, using a very thin palette knife, I slip hot hide-glue into the joint between plate and garland, and then add more spool clamps to draw the joint closed. 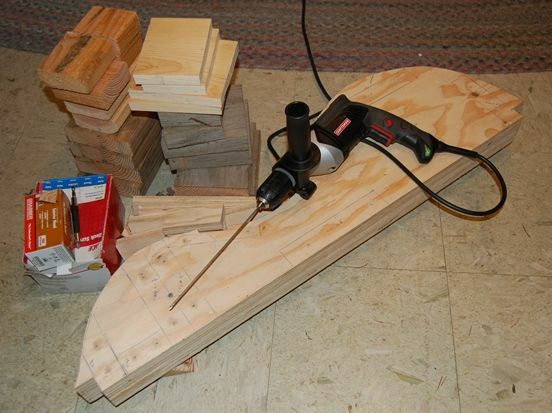 This is a very “stress-free” way to glue plates in place. 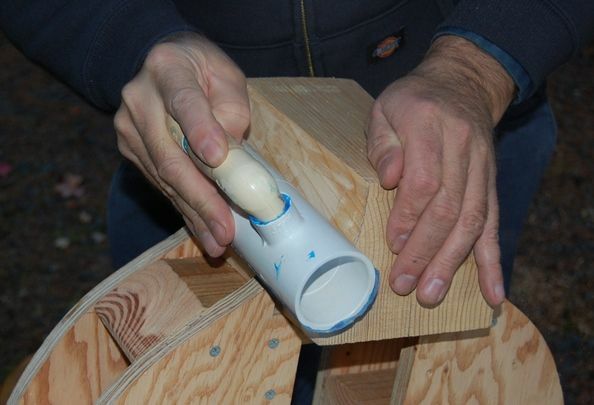 I used to experience near-panic every time I installed a plate, racing to clamp the joint before the glue gelled, but now it is a very easy and relaxed task. As you may remember, I have not yet installed the purfling. 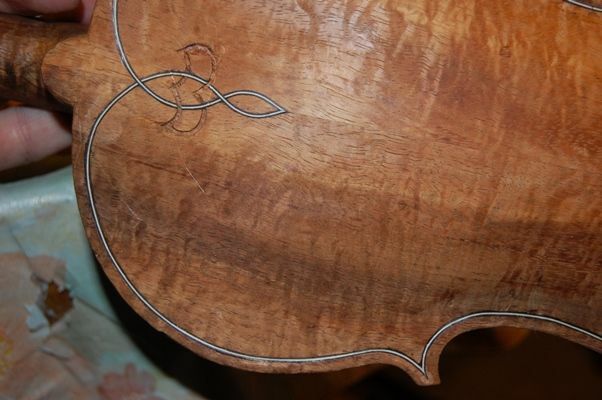 I wait until the plate is on the garland before purfling nowadays, because the purfling “locks-in” the location of the plate edge, and I have had problems in the past with the rib garland changing shape a little, between my tracing the plate and trying to install it. so, after gluing the plate to the garland, the first step is to double check my over-hangs, to see that they are all pretty close to the same. If I need to change them, I do so: I am free to adjust the shape of the plate to match the garland again. When the overhangs are all acceptable, I begin purfling. Before I begin cutting the channel I use a compass to mark a line all the way around the instrument, 1.6 mm in from the outer edge. Then, using a sharp, curved gouge, I cut my channel to that edge crest line, trying to cut the whole channel to intersect the surface of the purfling and that pencil line. Once I have the purfling completed and the channel cut, I still have to fair-in the surface of the rest of the plate to match the curvature of the channel. I do not want there to be any sudden changes; humps and hollows catch the eye of the person looking, and call into question the skill of the maker. (Besides, I think they are ugly….) 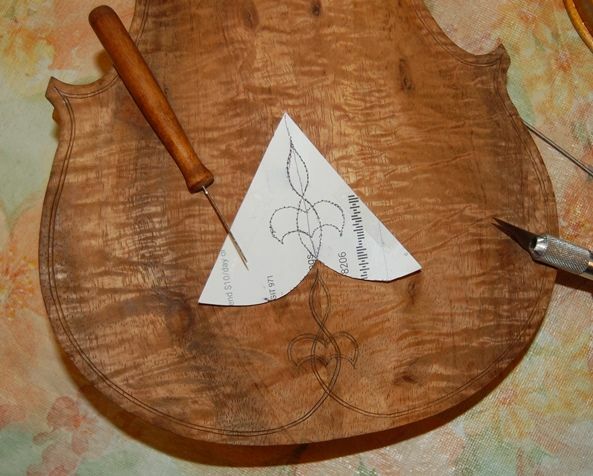 I use a very sharp finger-plane to begin shaping the surface of the plate and approximating the final curves I want. Finally I use sharp scrapers to bring the curvature of the whole plate to its final shape. I use a low-angle light to cast shadows from any humps or hollows, so that I can spot them and scrape them away. At this point, the scraper has to be sharp, and I have to use a gentle touch. The changes I am making are frequently much thinner than a piece of paper. After the whole plate is the shape I want, the last task is to shape the outer edge. 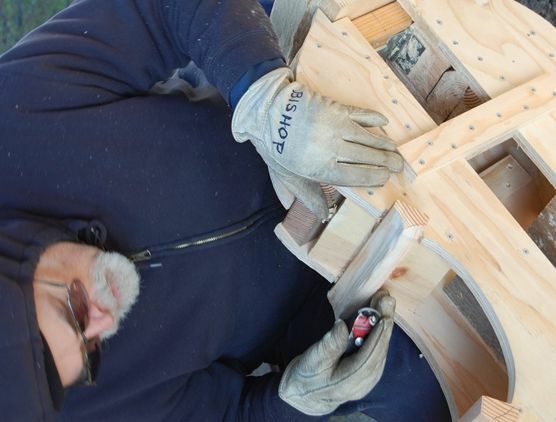 I begin by using a tiny finger-plane to take the outer corners down at a 45 degree angle, then use half-round files to shape the edge all the way around, bringing the curve of the outer edge up to just intersect the edge-crest line I established earlier. I get it as smooth and even as I can, using a file, but I know when I stain the wood with coffee, it will raise the grain terribly along these edges, so I will eventually re-smooth all of them, using abrasive paper of some sort. 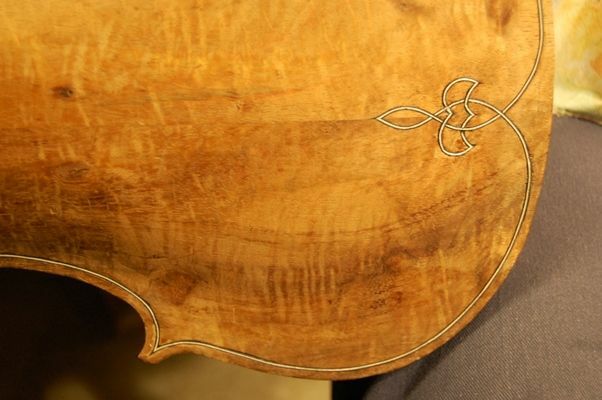 In this particular case, I did the outer edgework after setting the neck. No special reason…that is just what I did. I measure carefully, and cut the tapered mortise using a razor-saw, then use a sharp chisel to remove the waste wood of the mortise. If I do the job correctly, it works very well. 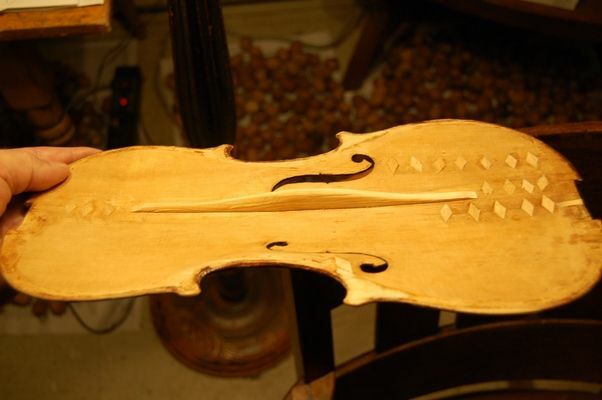 I check the sides and bottom to the mortise to see that they are flat and straight, then begin attempting to fit the neck. 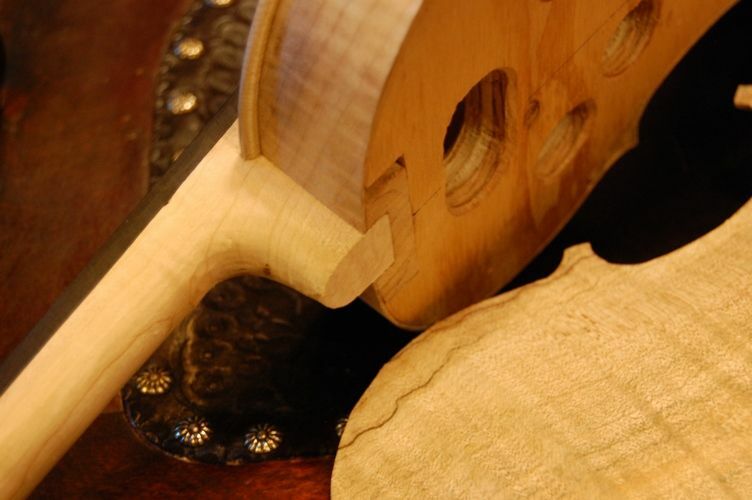 I have already joined the fingerboard to the neck and have shaped the heel where it will join the neck-block. 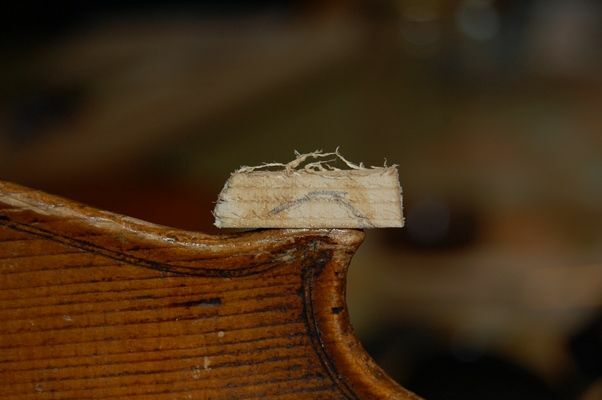 So, from this point forward, all the shaping and adjustment will be done to the mortise, not the neck. When I am satisfied that the fit is correct, the neck will have to be centered. 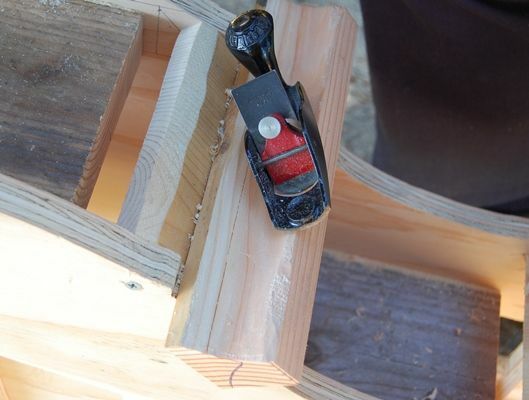 straight with the centerline of the front plate, straight with the centerline of the end block (not twisted at all), and at the correct angle to place the end of the fingerboard at the right height. Also, of course, the neck has to be set so that the distance from the nut to the edge of the front plate is correct. I check and re-check, until everything works correctly. Since I set the neck before installing the back plate, I want the heel of the neck to protrude past the back end of the neck-block. I will plane it flush after the glue is dry. Here is the completed mortise, cut for the neck. The outer edgework has yet to be completed. You can see the edge-crest marks. 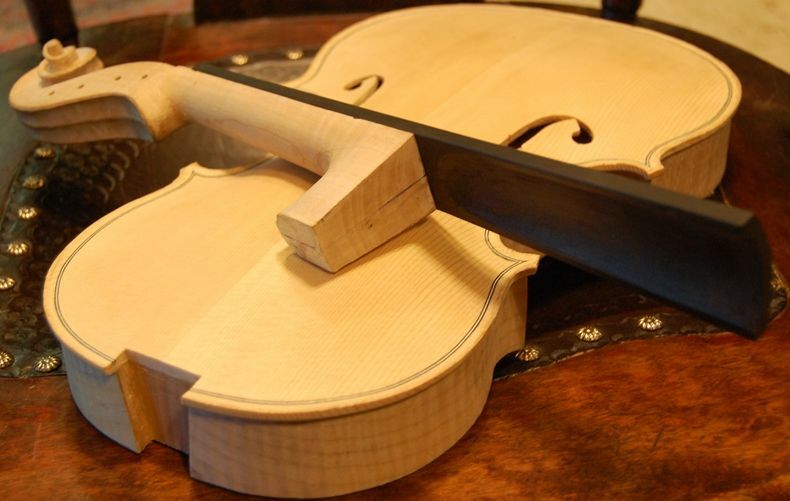 The mortise is complete, and I am ready to set the neck. There is the dry-fit neck set. 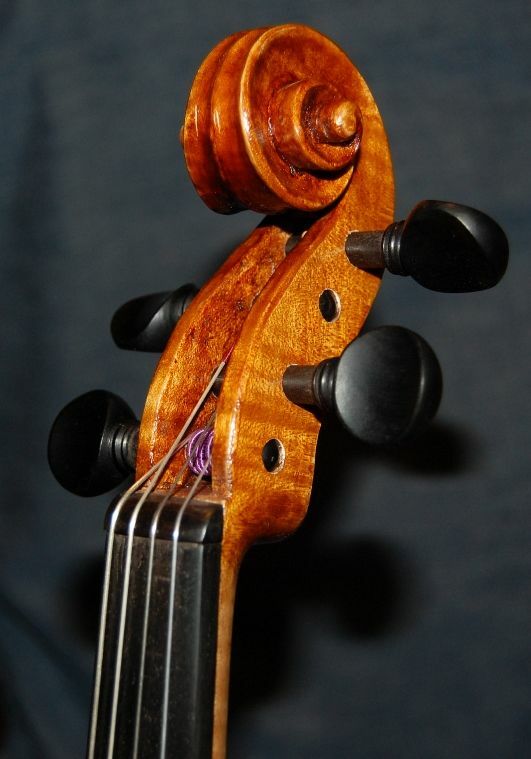 Notice the overhang of the heel of the neck beyond the neck-block. That will be planed off after the glue is dry. So there is the dry-fit assembly. 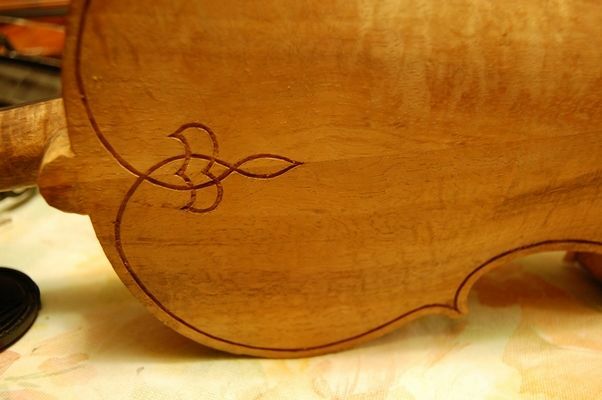 It is starting to look like a viola! When every measurement is correct simultneously, and the fit is tight, I remove the neck one last time and slather hot hide glue into the neck mortise. 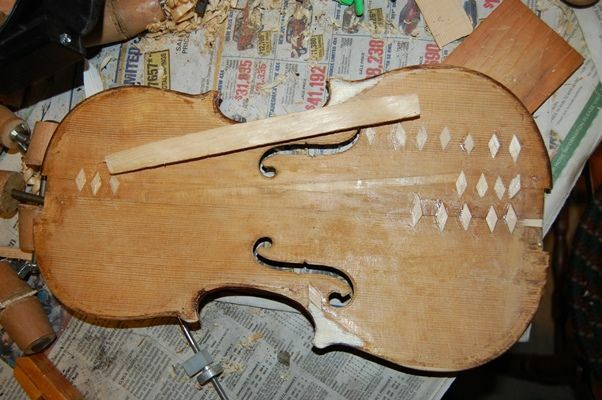 Immediately I jam the neck into place, and quickly check all those measurements again. Bingo! They are all correct, and I can relax while the glue dries! 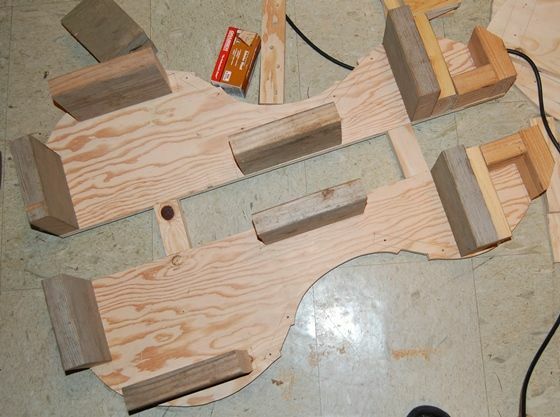 Once the glue is dry, I plane off the neck heel overhang, flush with the neck-block. 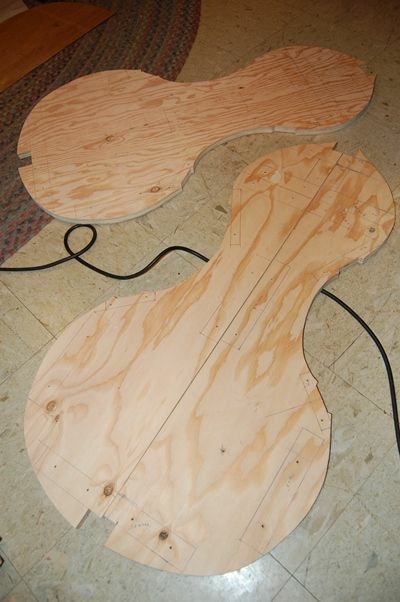 The glue is dry, and the neck-heel overhang has been planed flush with the neck block. I am ready to remove the mold. In this picture, I have filed the outer edge curvature already, and, though you can’t see it in this photo, I have also completed the graduations on the back plate, and have filed its inner edges, so it is ready to install. But; before I can do that, I have to remove the mold and add the back linings. Ready to remove the mold. Dreaming of the next step! 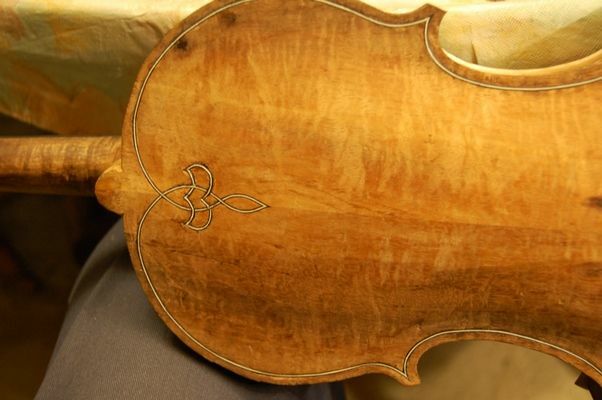 I am getting tired, though, and have some other things that need doing, so the viola will have to wait until another day to move any further toward completion. Lots of Wood to Move! 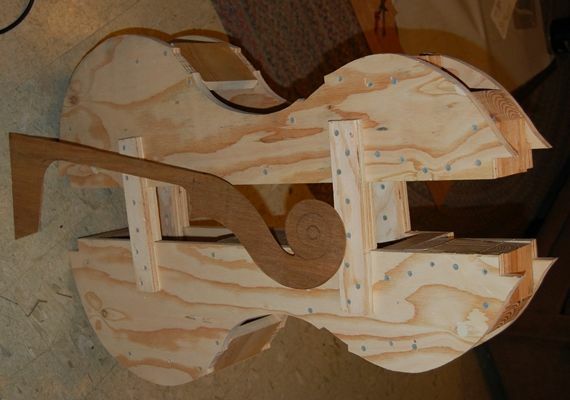 As you may recall from the previous post, the blocks on this upright bass were pretty huge, compared to what they needed to be, so there was really a lot of wood to remove. Mold with blocks and ribs. Blocks are still way oversized, and the ribs are still straight. Gotta change all that. So! A drastic need makes for drastic measures. 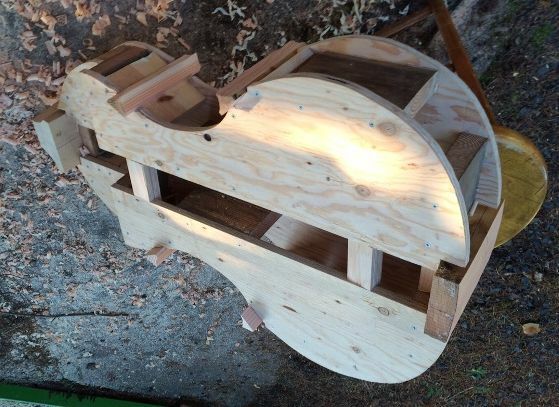 Ordinarily, on a smaller instrument, I would use the bandsaw and oscillating spindle sander to shape the blocks, but this mold is reeaaalllly heavy (over-built, I think…oh, well, it will be removed and the bass will be normal), even though it is a soloist bass, so I can’t see trying to manhandle it around on my big bandsaw. 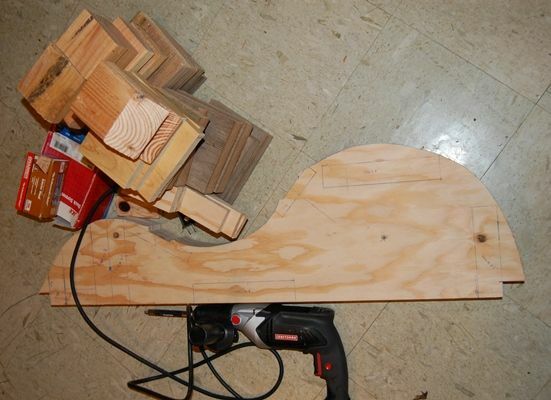 The saw could handle it, but the table for the saw is not big enough to hold the mold steady, and I am not strong enough to just hold it up there by sheer strength…. So… what to do? 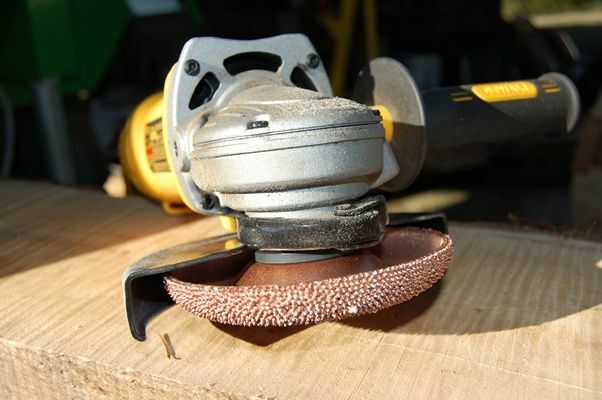 Kutzall disc, with 5″ DeWalt angle grinder: Not for the faint of heart! Absolutely wickedly effective, but not as dangerous as the Lancelot tool. 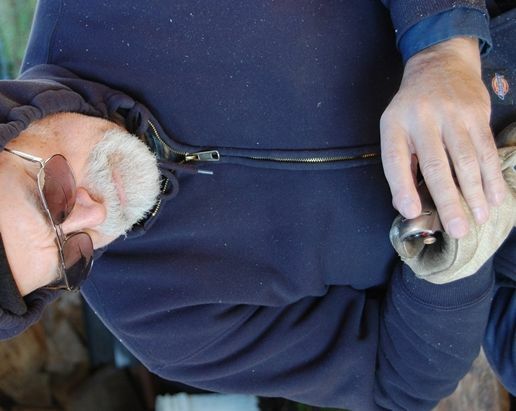 It was about 37 degrees, F, outside, but the sun was bright, so I worked outside. Smoothing and shaping the corner blocks, using a Stanley “Squirrel-tail” #100-1/2 hand-plane. The little plane is somewhat hard to control, because the curvature of the sole is so extreme, but, if it is sharp and if the blade is set for a very shallow cut, it works well. 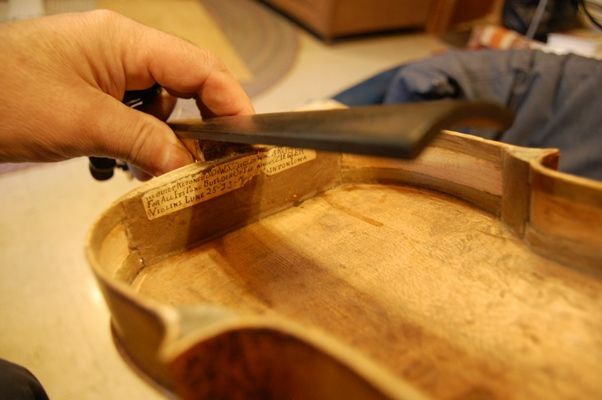 Stanley # 100-1/2 curved-sole plane…for those of you who are unfamiliar with it. I was able to shape the blocks pretty close to finished shape with the little plane, but there are some irregularities. I have another tool for that problem. Bottom block planed with a small, flat-sole, low-angle plane. All the blocks, ready for coarse-sanding. The small plane leaves ripples. The sanding tool should remove them all. As I mentioned earlier, the oscillating spindle sander I have would not be tall enough for these blocks even if I could manhandle the mold up onto the machine. So, I made this little sanding tool out of re-claimed PVC fittings from the “Habitat for Humanity Re-Store”, and spent more on the little can of PVC cement from the hardware store than I did on all the other materials…about $2.50 at the Habitat store. I used PVC cement to affix the abrasive cloth to the pipe, too, and bound it up with strips of plastic bag until the solvent outgassed and the cement was set. 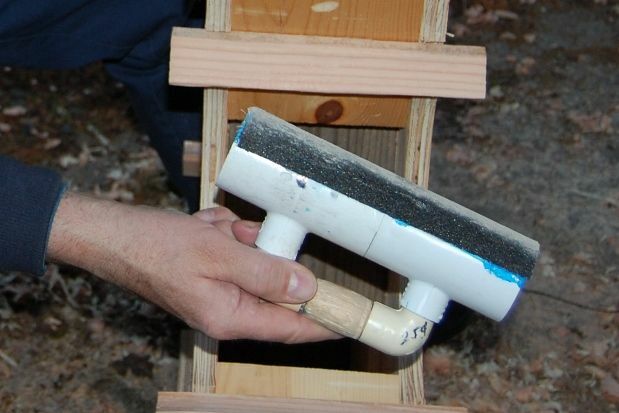 Sanding block fabricated from four PVC fittings and a 2″ section of 2″ PVC pipe, with a little piece of wood for the handle grip. Comfortable, efficient, and cheap. 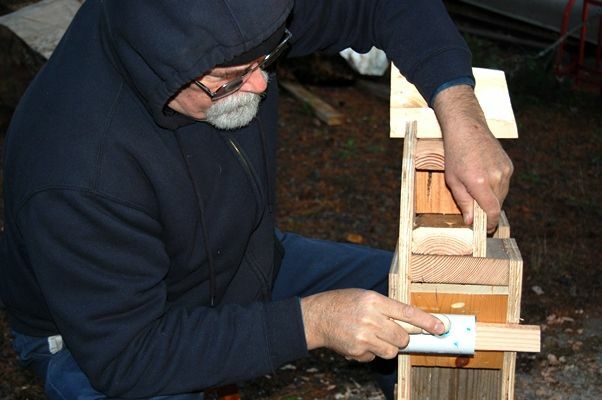 The homemade sanding tool worked extremely well for the small corner blocks, and did very smooth work. On the neck block I used it cross-grain, holding the tool parallel to the “trough” of the curvature, and sliding it up and down the curve. It worked well, there, too, just not as perfectly as on the corner blocks. All in all, it is a very satisfying tool. Sanding the neck block, I kept the block parallel to the “trough” of the curve, and pushed it up and down, across the grain to get a smooth surface. You may have noticed that, though I had planned to use Willow for blocks and linings, those blocks are not willow: the corner blocks and end block are all Douglas Fir, and the neck block is laid up of three layers of clear, vertical grain Sitka Spruce. It was a matter of availability. I do have willow for the linings, and, as that in my preferred wood when I have a choice, that is what I will use. It cuts easily, bends easily, and is very pleasant to work with for both linings and blocks. I have really felt that I was “spinning my wheels” on this project. It is large enough that I feel the necessity to work outdoors whenever possible, but the weather has not cooperated very well…it rained nearly every day for the last month. In addition, I have been struggling with a cold or some such virus. Today I was cold in the house when the thermometer read 75 degrees, so that is not normal. I finally felt a little better, this evening, and went outside for the few minutes it took me to sand the blocks, but it has been cold out, so I didn’t stay long. Ah, well, that’s life. I’m grateful to be back on the project again. We frequently hear the term “basket-case” in reference to one’s mental-state, but it originated in the reality of all the parts of a dilapidated mechanism or household furnishing being literally placed into a basket and delivered to a craftsperson who (it was hoped) could put it back together and make it functional. 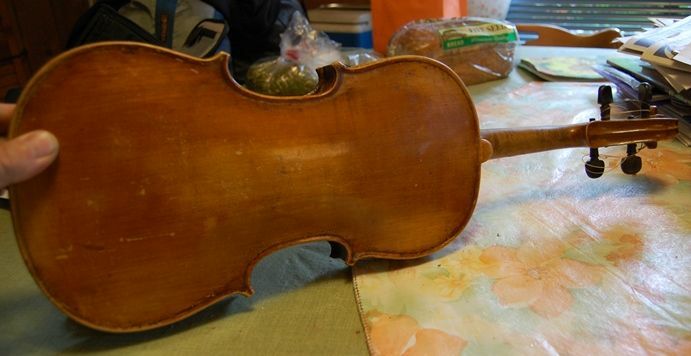 There have been a few times when I have received such a violin…usually either having belonged to the customer’s Great Aunt, or Grandfather, or something, or a relic from their own childhood (which they are trying to hang onto.) 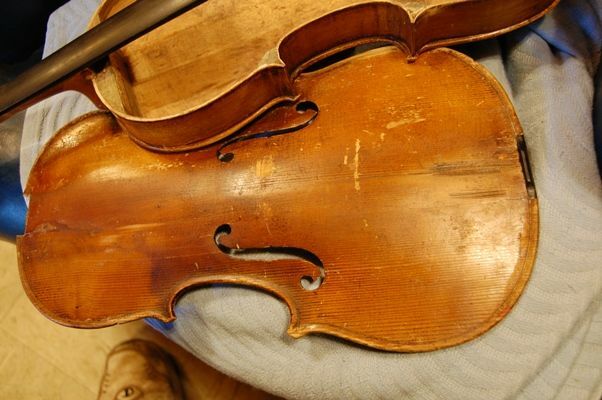 In some cases it is worse– the customer simply acquired the instrument at a garage sale (or some similar “depository of fine musical instruments”), in pieces, and wants me to make it work. 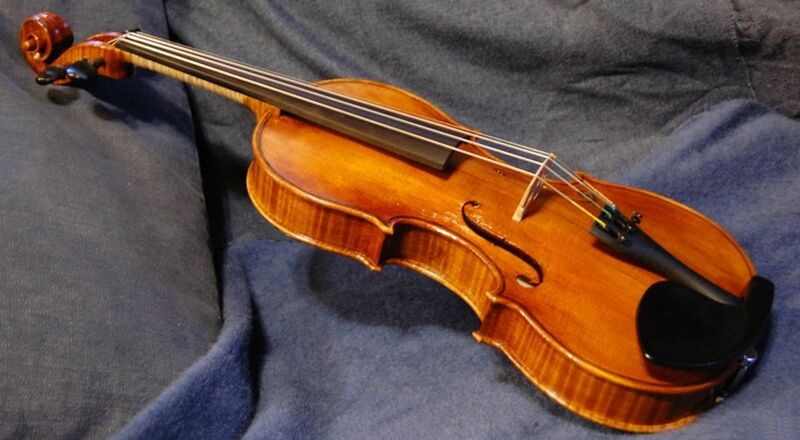 A few months ago, however, a parent contacted me, asking whether I had an “old fiddle” (full-size) for sale at a reasonable cost, to replace her daughter’s fractional size violin. Initially, I told her I did not, but upon further reflection, it occurred to me that I had the “bread-bag fiddle”. I told her exactly what it was, to the best of my knowledge (I had not opened it sufficiently to see some of the surprises), and suggested that, if I could make it a reasonable player for a price she could afford, that perhaps it would meet her expectations. I sent her some photos, so she could see that, at least for now, it sort of “put the ugh in ugly”, and that it would never win any prizes for looks, regardless of what I did. Back was not as bad, but very plain. 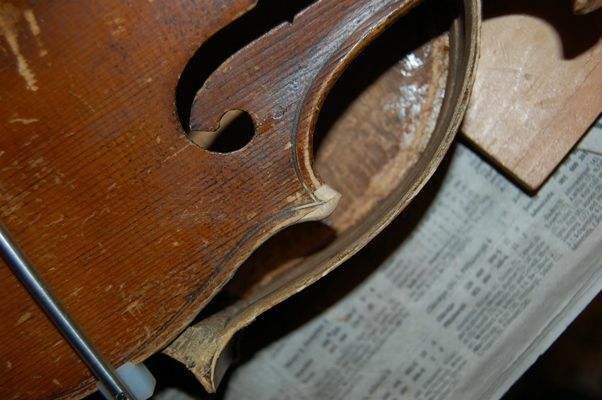 But–some folks like old fiddles! 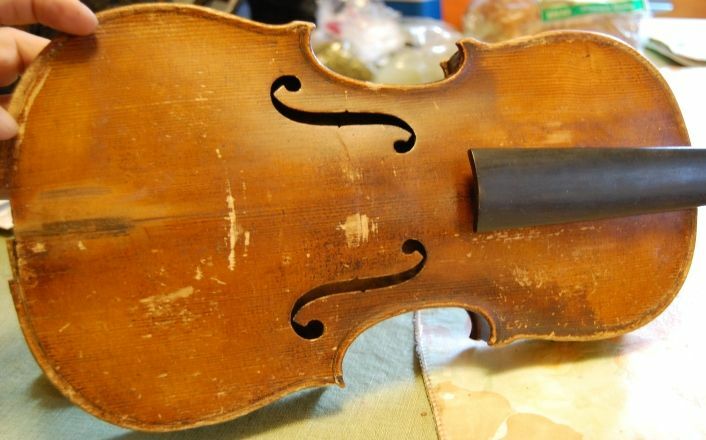 As it turned out, she and her family were pleased with the prospect, and told me to carry on with the “restoration.” (I repeat…this is not a true restoration, but rather a “revival” or “resurrection” of a dead or nearly-dead violin.) I had another commission going at the time, and I let them know that I could not begin immediately, but they were not in a hurry, so it was agreed that their project was next in line. I was able to begin about a month later. 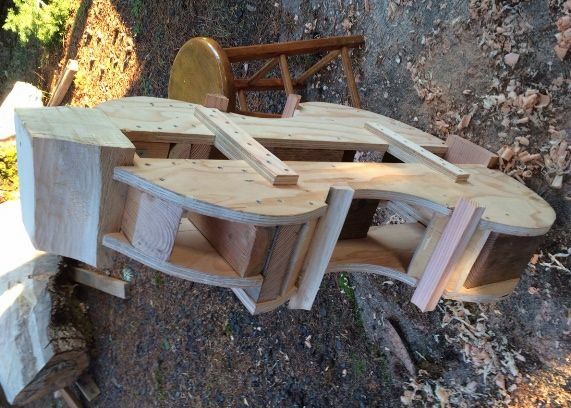 Loose ribs, detached saddle, separated top and bottom plates. End pin was long-gone. 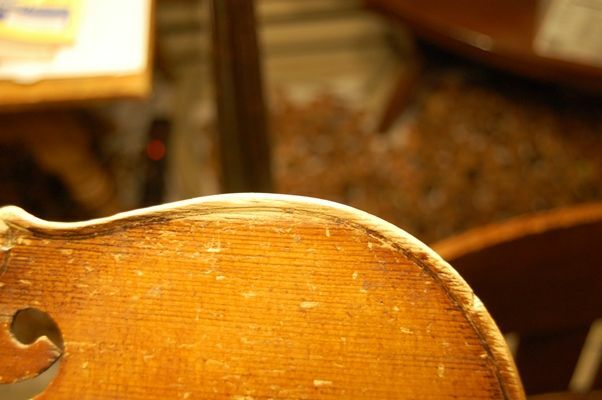 Three of the four corners of the spruce top had missing wood, along with one lower-bout edge. One of the three had wood broken off, not just chipped or worn. Missing corner wood, snapped off at the purfling miter. The exterior was bad enough, but when I opened the corpus I found the history, literally written on a label, and proudly claiming responsibility for the carnage within. 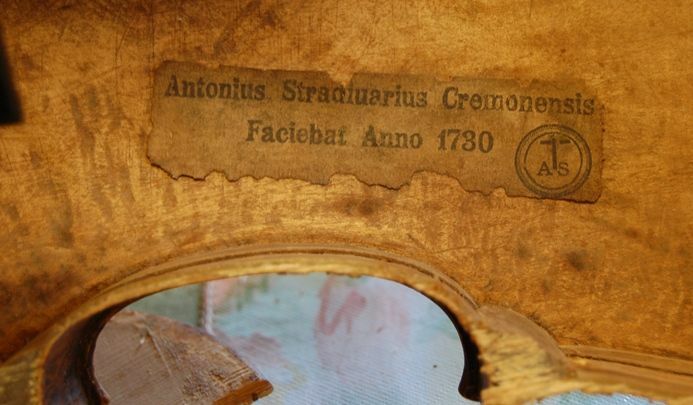 The inevitable “Stradiuarius” label: inserted in literally millions of instruments churned out of factories and cottage industries in the late 1800’s. 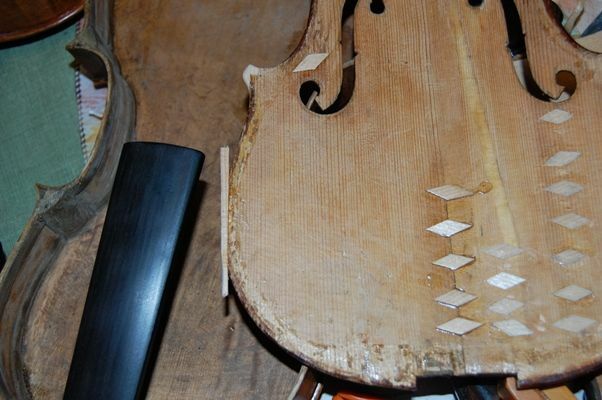 Those chips of spruce stuck to the end block were glued back in place in the top plate, along with other, earlier missing wood. The “repairer-rebuilder-innovator” had removed the normal blocks and replaced them with very heavy, oversized, hardwood blocks. That was bad enough, but he had also (in response to a bass-bar crack) installed a bar at about a 20 degree angle across the longitudinal axis, rather than the 2 degree (or thereabouts) angle that is normal. 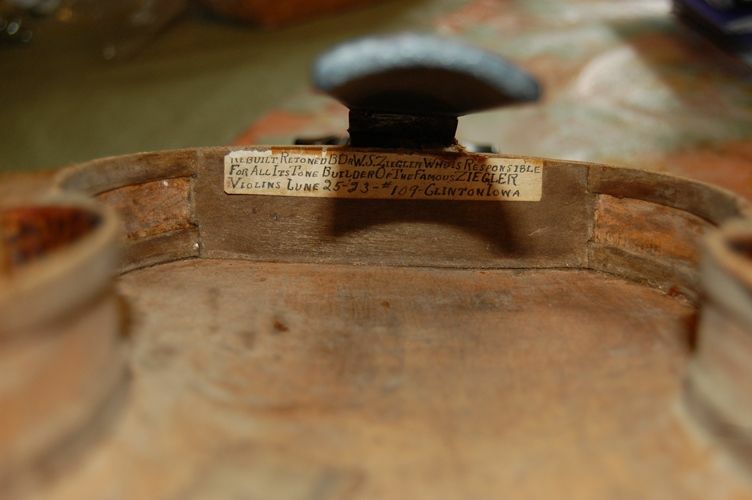 One thing to be observed, too, is the peculiar “mottled” look of the inside of the top plate, and how much fresher the wood appears here, than inside the back. 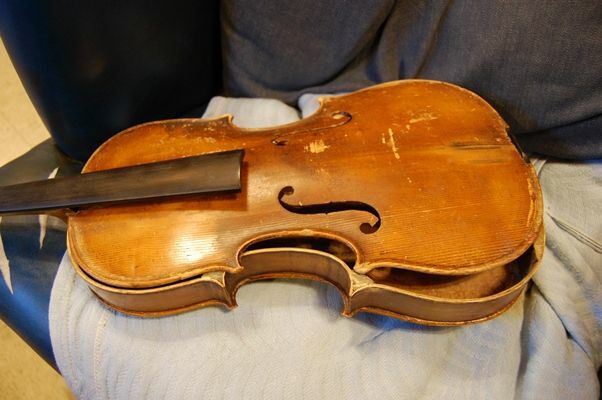 From this, I see that this instrument was originally one of the very cheap fiddles for which the maker took not even the trouble of smoothing the inside of the top plate, but left it extremely rough, like chainsaw sculpture, in the knowledge that few, if any, would ever see it, whereas the back was very smooth inside, where any eye could glance inside and see the work. 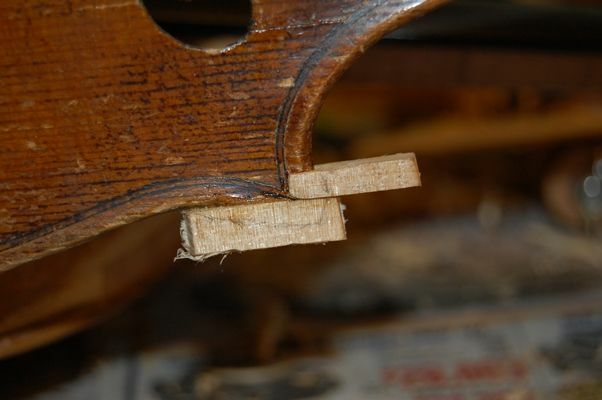 The “re-builder” smoothed all the rough gouge-work, removing the original “integral” bass bar (which had been carved in place, out of the same billet as the rest of the top, not carved separately and fitted to the plate), and had continued by adding the big blocks, slanting bar, etc. How do I know? Because I have smoothed such an instrument myself, and that is how the top plate looks afterward. 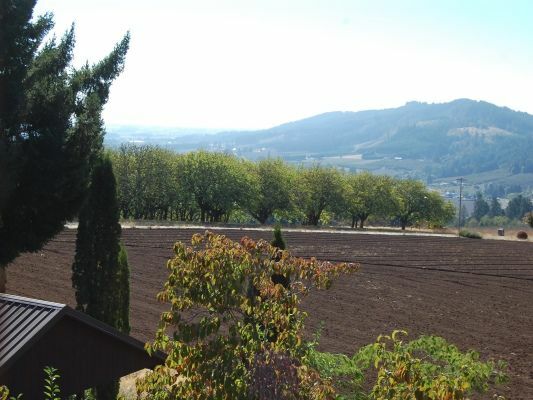 The areas where the most wood was removed are quite bright, whereas the places where only a little smoothing was in order are darker, showing the oxidation of the years. No harm done, there, and he did a fair job of it. Whack-o bass-bar. Bad-repair of center-seam, too. The ribs (as they came from the low-end European factory) were 2-3 times the thickness they should have been , in the upper bouts, though pretty close to normal in the lower and center bouts. There were several cracks. Some I had seen from the outside– some became obvious when I opened the box. Inside (due to inexpert top removals over the century or so of the fiddle’s existence), sufficient wood had been lost in the areas of the corner blocks that I felt it was necessary to replace wood there, as well. Re-gluing the back to the garland. You can see that I was also working on the top plate. I scraped and scraped the block and ribs, to try to get the loose ribs to fit back in place perfectly, but, in the end, they still were pretty rough. I kept telling myself that this was not a restoration, just a resurrection. I soaked loose the old, dirty glue in the center seam, and pulled it together as tightly as possible, then re-glued and clamped it. I went ahead and glued as many cracks as I could manage at the same time, wedging them in or out, as was needed to make them flush on the outside and tight, edge-to edge. I added the orange clamps as two pairs of “legs”, so that the plate could stand on edge and not twist under its own weight and that of the clamps. Multiple repairs in progress: center-seam, cracks, and missing corners. 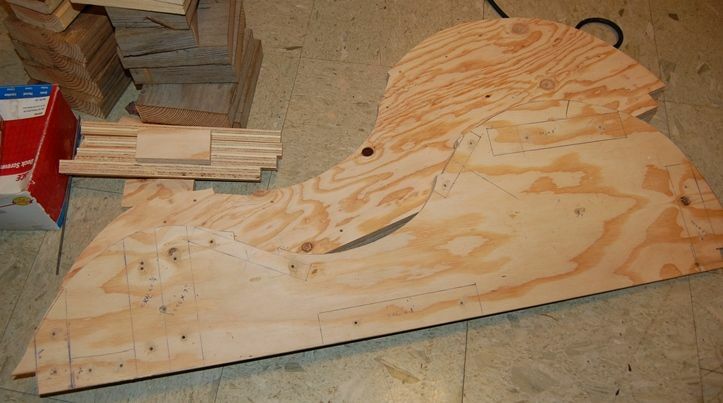 Spruce block glued in place, and shape of corner traced on the block. Two blocks required on this corner. 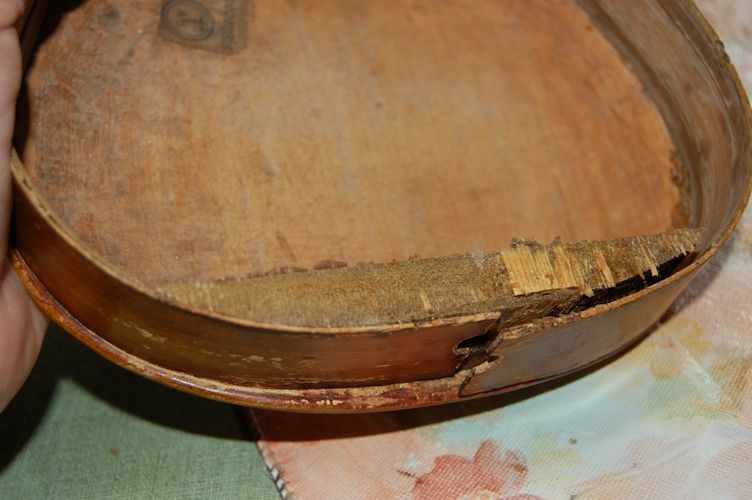 There was a third corner needing a minor wood-replacement, and a lower-bout edge worn (and splintered) off, as well. the procedure for replacement was the same in all cases. After the glue was dry on the replaced corners, I carved and filed the new wood to match the old shape. One new corner nearly complete. Another replaced corner nearly complete. One lower bout had a missing edge, too, so I glued new spruce in place, and, after the glue was dry, I carved and filed it to match the original curve. Missing wood replaced on lower bout edge. 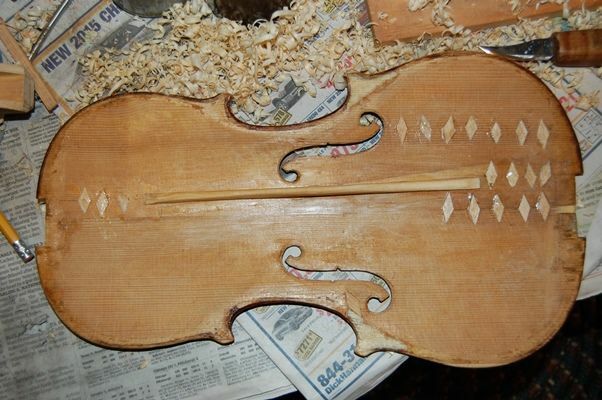 The wood will be filed and carved to shape. Replaced edge ready for coloring and varnishing. Later, I will stain the new wood to match the old, using coffee, dirt, and ash, then retouch the varnish to match the old varnish. The bass-bar had to come out, so, after the glue had dried in the various cracks, I planed out the old bar, (and glued “cleats” on the inside along each crack) and prepared to fit a new bar. The bass-bar was going to have to be shorter than usual, as the huge end blocks crowded the normal position. 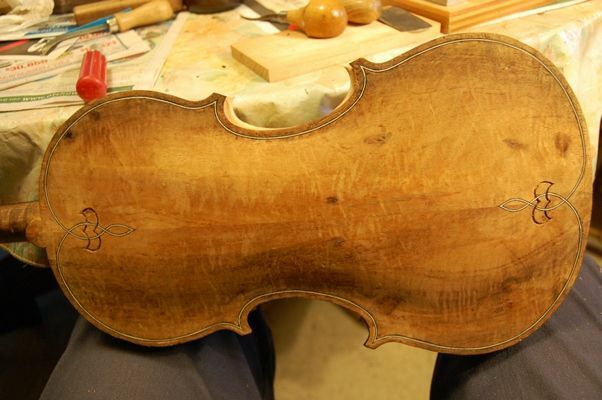 Cracks and center-seam cleated from inside; old bassbar planed out, and new one ready for fitting. You can see that I had already begun replacing the wood missing from the inside corners: I sawed a 1 mm-thick “veneer” of clear, vertical grained spruce, glued it to the smoothed and flattened corners, and later planed it flush with the surrounding areas. The bass-bar fitting went quite smoothly, using chalk on the inside of the top plate, and pressing the bar against the chalked area to disclose the high spots on the bar. I had it ready to glue in a pretty short time, and trimmed it the next morning, after the glue was dry. New bass-bar, glued and trimmed. 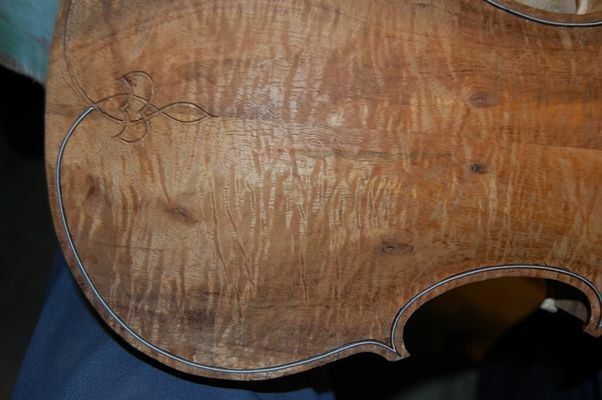 Side view of new bass-bar, stained with coffee (which also raised the grain.) I sanded it afterward, to smooth it again. 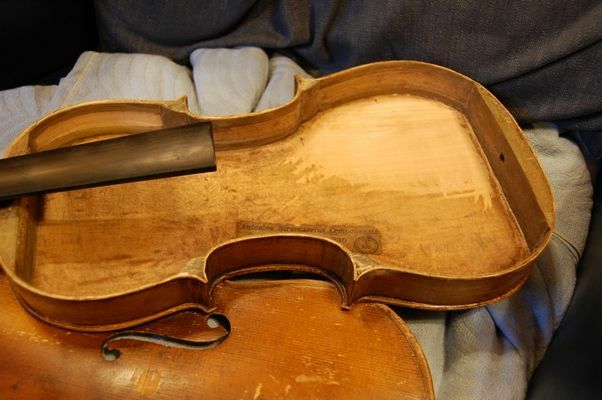 Once the entire interior was smooth, with all missing wood replaced, I could start thinking about closing up the body of the violin. 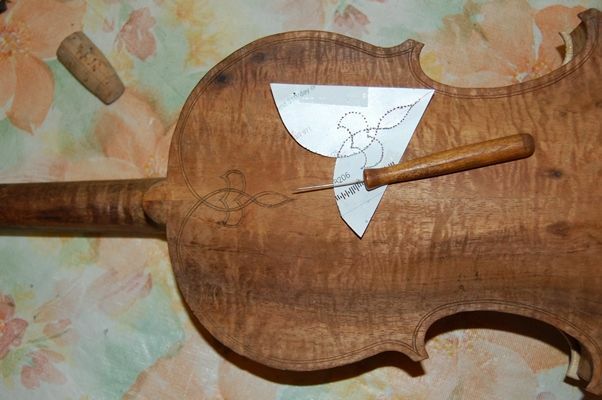 I re-fit and glued in place the saddle that had come with the fiddle. 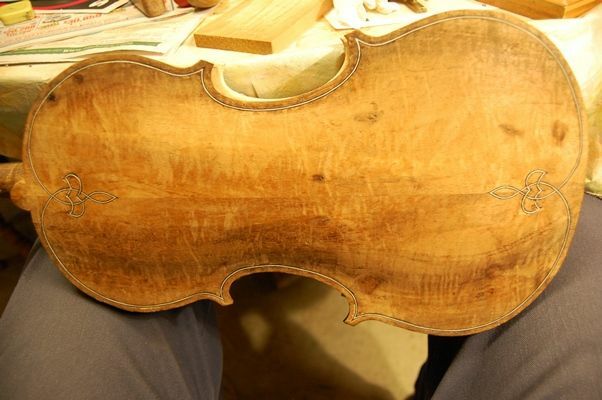 Meanwhile, I had checked the back and ribs for appropriate thickness– a few areas of the back were abnormally thick, so I planed and scraped a millimeter (or so) of wood out of those areas, then even more from the upper bout ribs, where the wood was three times the normal 1 mm thickness. Perhaps it will help…. Scraped upper bout ribs showing white against the patina of age. 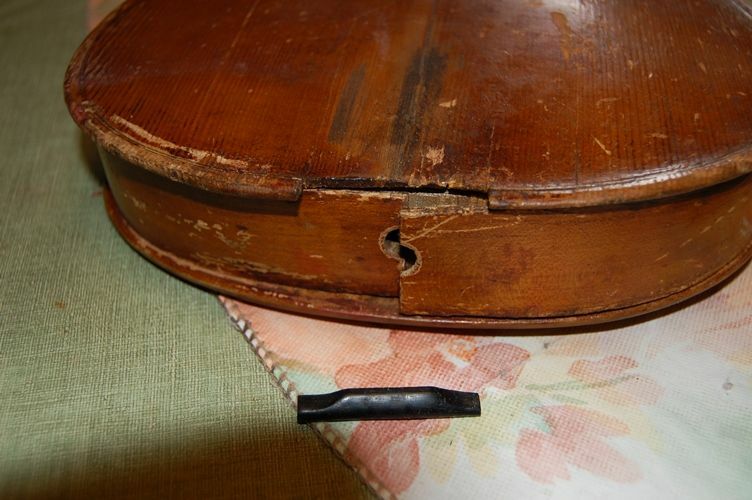 Lower back was too thick on the treble side. Other than that it wasn’t too bad. I dry clamped the whole corpus (body) in exactly the way I wanted it to go together, using spool clamps, just like the ones used when I was gluing the back to the garland, above. Then, when I was sure everything was right, I heated hide glue, and, loosening a few clamps at a time, I used a palette knife to carefully insert the thin, hot, hide glue between the front plate and the linings and blocks. Then I re-applied those few clamps and repeated the process with the next few clamps until I had glued all the way around. I seldom think to take photos of thsi process, so…there aren’t any. Sorry. Once the glue was dry, I could take off the clamps and get ready to begin final touch-up of varnish, and general polishing. Closed, and ready to begin finishing. Old strings still tangled on the pegbox. And, the front! Still lots of “owies…” But, when I tap it, it tries to talk…I think it’s gonna sing pretty good! 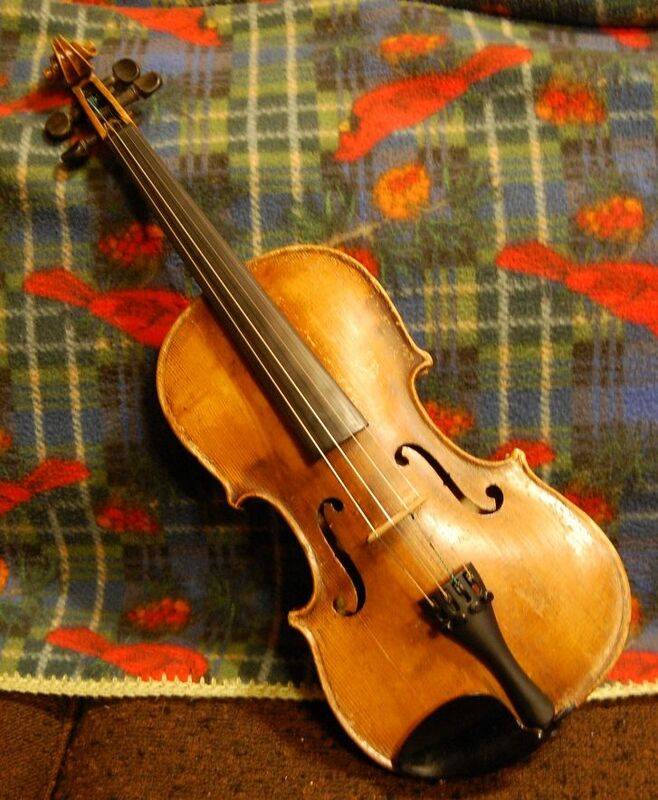 Warm, friendly Old Fiddle, headed for a new home. 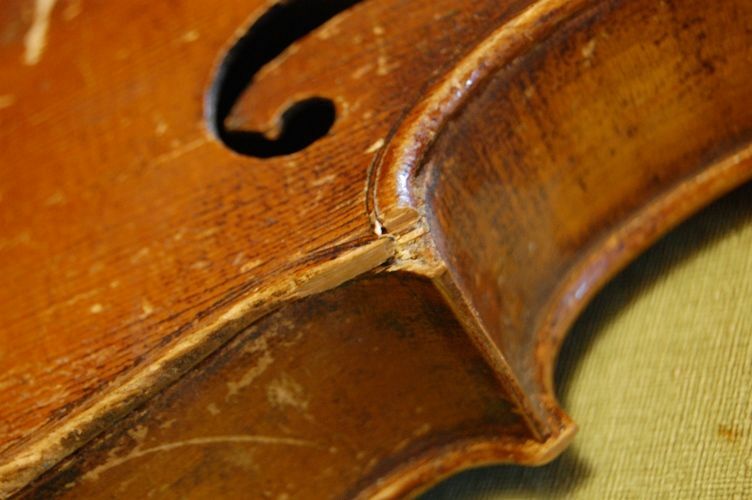 Not all of the old scars have become invisible (though some have)…some are a permanent part of this old fiddle’s character, and simply show that is has been well-loved and well-played. Future things will undoubtedly include a new fingerboard (someday) and new pegs (eventually). But for now, it is ready to sing. 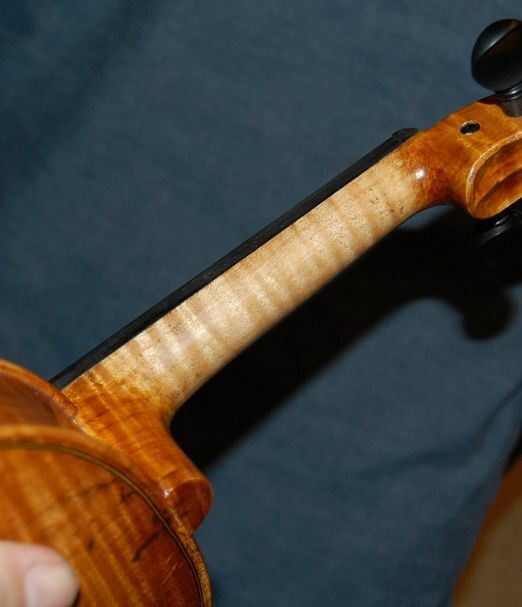 The old fiddle turned out to have a rich, deep voice, and the new owners are very happy with it. I hope to hear the young lady play someday.